Editor’s note: Students in instructor Christine Mahoney’s Radio/TV News Writing Course at the newly-formed Journalism Program at CU-Boulder are participating in the Blue Line’s coverage of the local election by interviewing Boulder City Council candidates. Thanks for supporting the students, and helping them gain experience and exposure, as they learn the craft of journalism. 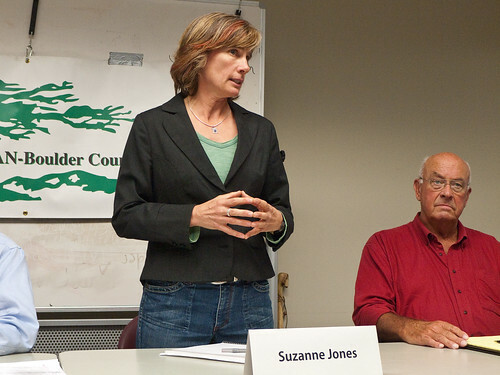 Suzanne Jones, a Boulder resident of 16 years, is running for the Boulder City Council. She says Boulder is a great town but, “We need to keep the momentum moving forward. The public really steps up here. It’s a great place, but there are things we can improve.” At the top of Jones’ goals is to create a budget that reflects the priorities of the people, re-develop the downtown arts district, de-polarize open space, and have an infrastructure that supports parks and libraries. Jones is the regional director for the Wilderness Society, which is the leading conservation agency that works to protect U.S. public land. This passion for the environment is also evident in her campaign. She says she wants to, “continue and enhance,” the open space program to make Boulder inclusive and inviting. She also wants to make the Eco Pass more accessible and successful. The Eco Pass is an annual bus pass that businesses can purchase for their employees which gives them unlimited rides on any local, express, or regional bus. Bringing to the table government experience, Jones was a legislative representative for the National Wildlife Federation in D.C. for 3 years. She also worked as a congressional staff member of the Fisheries and Wildlife Subcommittee in the House of Representatives for a year. Next Topic: Forum: What’s Up With Ballot Question 2H? Just to be clear, passing 2B and 2C will NOT create a municipal utility — though this is what the opposition would like you to believe. The measures empower City Council to investigate the feasibility of a muni further, and empower them to create one, if and only if the plan for doing so meets several requirements, which are laid out in the ballot measures and associated ordinances.